Which matters most, management or industry? Investors have been wrestling with that question for decades. Some, including Warren Buffett, have taken the position that industry is almost everything, and that even the most brilliant manager is doomed in a doggy business. Yet securities analysts spend much of their time assessing the abilities of a company’s executive team, particularly the person at the very top. In fact, Chief Executive’s third annual ranking of CEOs shows that the way to get really rich is to be right about both the industry and the individual. CE ranks the CEOs of the 1,000 largest U.S. companies on the basis of how much wealth they have created for shareholders, or their standardized MVA. Industry reigns at the very top. The upper echelon is populated almost exclusively by CEOs whose companies are reinventing the economy and creating a rapidly growing share of GDP in the process. Of the top 25 CEOs, nearly all run computer, communications, or Internet-related companies. No. 1 for the second year running is Bernard J. Ebbers of WorldCom, followed by Steve Case of AOL, who edged Bill Gates from second to third place. Of 70 computer company CEOs in the ranking, half are in the top 100 and 11 are among the top 25. In contrast, CEOs in the automotive, forest products, and chemical industries rarely make it past the middling range of the ranking. Fred Bauer of Gentex is way up at No. 39, but the No. 2 in automotive, Ranko Cucuz of Hayes Lemmerz International, ranks No. 569. Clifford Grum of Temple Inland, first in forest products, is No. 411 overall. 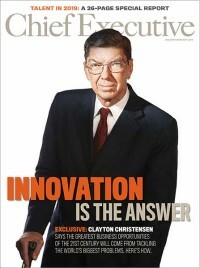 The best chemical CEO, Vincent A. Calarco of Crompton, ranks No. 291, and two-thirds of his brethren are in the bottom half of the ranking. In most industries, however, management is what makes the difference. Viewing the CEOs by industry, as they are grouped in the table that begins on page 40, shows that the rankings within most sectors pretty much cover the spectrum. In other words, it’s possible for investors to find winners and losers-in just about any industry. What’s more, the CEOs at the very bottom of the list do not run the classic “old economy” manufacturing companies that one would expect. Instead, they tend to be in service businesses, notably financial services, medical care and retailing. The CEO ranking defines wealth creation in terms of a measure called MVA, for market value added. MVA is the difference between the market value of a company and all the capital contributed by investors, including paid-in capital, retained earnings and loans. Stern Stewart & Co., which created the concept, maintains that MVA is the definitive measure of corporate performance because it captures the stock market’s assessment of the dollar amount by which each company has added to or subtracted from the wealth entrusted to it by investors. The change in MVA from one point to another is the amount of wealth created or destroyed over that period. Instead of ranking companies, as Stern Stewart usually does, Chief Executive and Stern Stewart have ranked CEOs. We do so by looking at the change in MVA over the years that each CEO has been in office. Since the goal of every company is to take funds contributed by investors and make them worth more, MVA permits direct comparisons across industries. After all, what really matters from the investor’s perspective is the difference between cash in and cash out, not the industry where managers elect to put the cash. However, simply using the “raw” change in MVA would be misleading. Since MVA is a dollar measure rather than a rate of return, CEOs of the very largest companies would be bunched at the top or bottom of the ranking because of size alone. To enable direct comparisons between CEOs of companies of radically different size, Stern Stewart “standardized” the changes in MVA by scaling them according to the amount of capital each company had when the incumbent CEO took office. Thus, the ranking is in terms of how much MVA a CEO has created per dollar of beginning capital. The ranking is based on market values and capital at the end of 1999; it includes only 949 individuals because there are no figures for change in MVA for CEOs who took office in the second half of 1999. It includes all CEOs who were in office at the end of last year but have moved on since then. To see the effect of standardizing, look at the comparison between Richard M. Schulze of Best Buy and L.D. Jorndt of Walgreens. Schulze has produced $9.9 billion of MVA, a tidy sum by any measure. On an unadjusted basis, Jorndt looks to be the better performer: Walgreens’ MVA has risen $12.9 billion under his stewardship,vs. $9.9 billion for Schulze’s years at Best Buy. However, Jorndt had been running Walgreens for just two years at the end of 1999, and the company had nearly $13 billion in MVA and more than $3 billion in capital when he got the top job. Doubling the company’s MVA and nearly doubling its market value in just two years are two huge achievements, even in a roaring bull market. Still, that’s arguably not as impressive as Schulze’s achievement when you consider that he started at ground zero back in 1966 and built Best Buy from scratch. When the change in MVA is standardized as a percentage of capital at the beginning of the CEO’s tenure, Schulze emerges as the most efficient wealth creator among retailing CEOs,and 18th overall. He has created a stunning $798.95 of MVA per dollar of beginning capital. Jorndt, in contrast, comes in at No. 311 overall with an increase of $4.07 of MVA for each dollar of beginning capital. To be sure, that’s exemplary in a universe where the median wealth creation is $1.01 per dollar of initial capital, and where most CEOs have been in office much longer. (Tenure is a huge advantage in a protracted bull market.) But Jorndt still is a long way from the very top. This year, the table shows a CEO’s ranking for both the current year and the year prior. Some of the changes are enormous, especially at the very top and bottom. Noam Lotan of MVR Communications leapt all the way from 948 at the end of 1998 to No. 23 at the end of 1999, while Irwin Jacobs of QUALCOMM jumped from No. 97 to No. 8 and Kevin N. Kalkhoven went from No. 29 to No. 4. At the other end, David Fuente of Office Depot fell from an enviable No. 50 to No. 946, while R.B. Martin of Saks, another retailer, dropped from No. 99 to No. 929. David Wetherell’s CMGI have fared even worse. But some tech companies continue to perform exceptionally well-MRV Communications and JDS Uniphase are up handsomely, for example. Still, it will be tough for Jozef Straus, the new CEO of Uniphase, to make it to the top because he has to build on what has been bequeathed him by Kalkhoven. On the other hand, today’s market is full of dramatic swings and surprises-so only time will tell. MVA, or market value added, is the most objective measure of corporate performance. It is the difference between invested capital (cash in) and what investors could sell their claims for on any given date (cash out). Developed by Stern Stewart & Co., it is the market’s verdict on how much wealth a company has created or destroyed (if MVA is negative) since its inception. MVA is a particularly useful measure because it allows direct comparisons of companies in different industries. Market value plainly does not work because it ignores the capital invested. At the end of 1999, Danaher and Northrop were just about dead even on a market value basis, at $7.9 billion and $7.8 billion respectively. But Danaher had invested capital of just $3.5 billion, while Northrop employed $9.3 billion of capital. Danaher had created about $4.4 billion of shareholder wealth (MVA), while Northrop was in the hole to the tune of $1.5 billion. To get a closer fix on how individual CEOs have performed, Stern Stewart calculates the change in MVA, or what it calls delta MVA, from the time a CEO took office to the end of last year. Stern Stewart computed delta MVAs for all CEOs in its Performance i000 database who took office before June 30, 1999 and were still in office at the end of 1999. Chief Executive and Stern Stewart made another refinement to better compare the performances of individual CEOs. We have divided the change in MVA by the amount of capital a company had when the CEO took over rather than simply looking at the raw change in MVA. Why? Because the Performance 1000 includes companies with market values that range from less than $1 billion to more than $600 billion. Since delta MVA is a dollar measure rather than a rate of return, direct comparisons between Davids and Goliaths don’t mean much. Dividing the delta MVA by beginning capital is a way of standardizing the changes and scaling them to the amount of capital a CEO had at his or her disposal. If the figure for the change in standardized MVA is 1.0 (about the median), it means that the CEO has created $1 of shareholder wealth for each dollar of beginning capital. At the end of 1999, the changes in standardized MVA ranged from $21,852.20 for Bernard Ebbers of WorldCom down to minus $2,147.96 for Alan Hoops of Pacificare Health Systems. No performance measure is perfect, of course. But the change in standardized MVA gives the best available measure of the efficiency with which CEOs have managed the capital that investors have entrusted to them. MVA: (market value added): MVA is the market value of a company’s equity plus the book value of its debt minus the capital contributed by shareholders and lenders. Capital: Stern Stewart & Co. makes a number of adjustments to accounting book value to arrive at a superior estimate of invested capital, or what might be thought of a “economic” book value. One adjustment is to capitalize R&D expenditures and amortize them over five years instead of expensing these investments in the year they are made. Similarly, Stern Stewart capitalizes marketing expenditures and amortizes them over three years. The result is that capital almost always is higher, and sometimes much higher, than book value. Start Date: The month that a CEO took office. Start Date MVA: In most cases, this is MVA at the year-end closest to the month that a CEO took office. There are exceptions, however, if the CEO took office before 1982 or if the company was privately held when he or she took office. In those cases, the start date MVA is later of December 1982 or December of the year the company went public. 1999 MVA: The company’s MVA as of December 31, 1999. Delta MVA: The change in a company’s MVA from the “start date MVA” to December 31, 1999. Delta MVA/Beginning Capital: The change in MVA expressed as a percentage of capital at the same date as the “start date MVA.” This calculation standardizes MVA according to the amount of invested capital a CEO had to work with at the beginning of his tenure, and greatly improves comparisons between companies of radically different sizes. In effect, it is a measure of the efficiency with which a CEO has used the capital at his or her command. Rank for 1999 Delta MVA/Beginning Capital: Where a CEO ranked in the Stern Stewart Performance l000 in terms of the standardized change in MVA at the end of 1999. Rank for 1998 Delta MVA/Beginning Capital: Where a CEO ranked at the end of 1998. Industry Rank: The CEO’s rank at the end of 1999 by standardized change in MVA within the company’s industry.